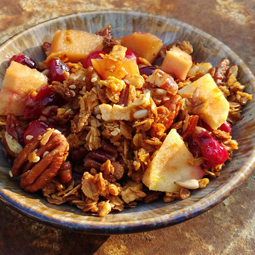 Quince, Cranberry, Pecan Crisp - A recipe from Savor California, the online showcase for extraordinary gourmet foods and beverages from California. Thanks for this recipe to The Produce Pair (Guido the Gardener and Dan the Produce Man) and Dan's Fresh Produce in Alameda. Pare, core and chop the quince. Place in 9x13 greased baking pan. Add cranberries, pecans and enough orange juice to moisten (juice of one orange should be enough). Mix ingredients. In a medium bowl, mix granola and butter until granola is fully covered in butter. Cover top of quince mixture with granola/butter mixture. Bake at 350 degrees for 30-45 minutes, until quince is soft and granola is crunchy.